Willow was Libby, the founder of Bali Paws, first rescue dog on Bali. While walking her dog Scout on the beach one morning she spotted Willow whimpering on the sand - hairless and scabby. After a quick phone call to Mission Pawsible she gained the courage to put Willow on a leash and head to the vet. Flash forward 3 months (2 wonderful foster homes with care and love) and now Willow has landed her 4 paws in am amazing home with two wonderful Swedish Expats in Bali AND she has a body full of fur! Fellow rescue friend Arya found Brownie and her 7 puppies near his workplace just days after they were born! With a quick call to Mission Pawsible Brownie and her babies were relocated to Happy Paws where they stayed in a private space for Brownie to nurse and care for her pups. As the babies got bigger and less dependent on mama Brownie we began an adoption campaign and within two weeks all seven puppies were adopted! One was even adopted by my good friend and fellow rescuer Marie and they now live together in Germany! Little Otis was rescued one evening as I was scootering home. It was already dark outside and when I took the turn onto my street I noticed a bright white object scurrying under a car. I quickly pulled to the side of the road and tired to get the puppy to come out, but being afraid he didn't budge! I went home to grab some food and on the second try was only able to scare the puppy even further under the car. Thankfully with the help of several neighbors we scooped up the puppy and took him straight to the vet. Otis was quickly adopted and is spending a wonderful life with his big brother Coconut. Poe was left to die on a quiet street in Bali. We found Poe on the way to work one morning - tired and alone. Our vet, the amazing Dr. Witari, took Poe to her clinic where she is currently spending her time recovering. Upon rescuing Poe we discovered she only has one eye. We look forward to watching her recover and living the life she should have had all along! Buddy was found up the street from Libby's house living in a gutter as a puppy. His mom was a street dog and watched over her babies until they started running around. Buddy lived with Libby for several months until he was big enough to find his forever home. With help from BAWA Buddy moved to Ubud and now lives with a wonderful Balinese family and their other dog too! Cookie used to hang around Matcha Cafe in Berawa however one day we noticed she was getting a bit too fat! Turns out it wasn't too many Matcha Lattes - but she was pregnant with 6 little babies. We relocated her to Happy Paws were she cared for her pups until they were old enough for adoption. The 6 girls and boys were snapped up quickly by loving families! Cookie was then sterilized and was living in a wonderful foster home with her 4 foster siblings - all corgis! Cookie now lives with her forever humans! We stumbled across Matcha as a very hungry beach dog on our morning walks. From that day on we carried extra dog food and a bottle of water for her every morning we went to the beach. After one month, once she was a bit healthier we took her to get sterilized with Bali Pet Crusaders. She spent 24 hours at the vet and then returned to her beach life where we watch over her. Recently two Swedish travelers fell in love with Matcha too and they have worked to find her a new home in a guest house! Matcha is safe and happy! Della Darling! 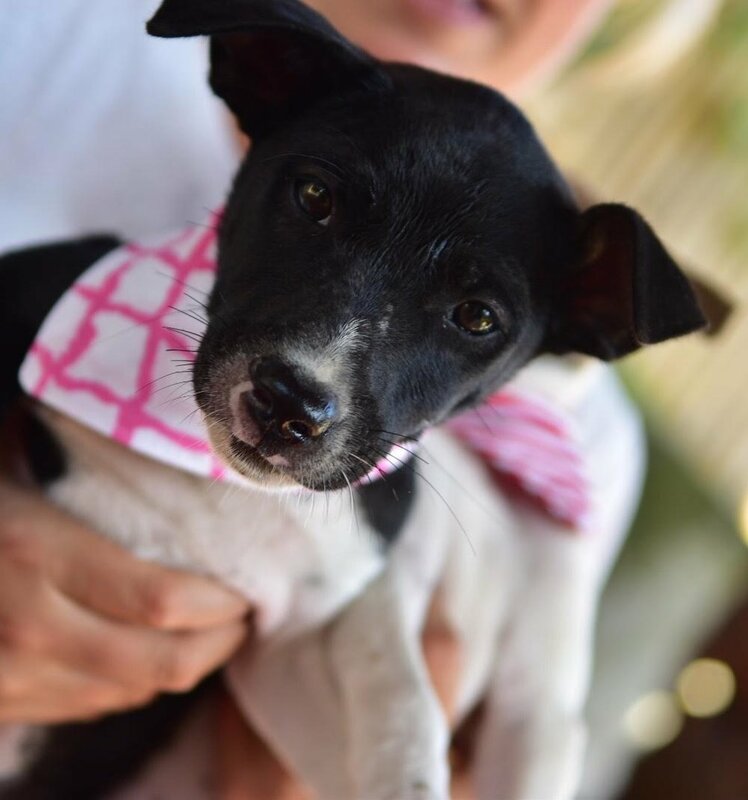 Della was rescued after being dumped at Old Mans Beach in Canggu. She was found dirty with cuts and wounds all over her body, specifically her face. We acted quickly and took Della to Sunset vet where she spent a week recovering. Della spent the last 4 months living in Happy Paws, a wonderful dog stay where she has been learning to gain trust for humans again. Della was adopted in July 2018 and is now called Pea. Her mom is from the UK and her dad is from the USA and they live in Bali! Indah was found on the side of the road between Ubud and Canggu. She was laying in a little wooden box without one strand of fur on her body. We quickly zipped her into a backpack and scootered to one of our favorite vets. She stayed with the vet for 2 weeks before moving to her current foster home thanks to the suggestion of Mission Pawsible. Indah was adopted to a lovely lady in CANADA and she made the big journey home in July 2018. Ollie caught my eye while I was driving to work one morning. At first I thought he was just relaxing on the side of the road, but as I slowed down I realized he was shaking and trying to stand up - but failing to do so. I called my wonderful local vet Dr. Witari and she came quickly with a cage and we transported Ollie to her clinic. The first few days Ollie wasn't improving and we were at a loss of how we could help him. Dr. Witari suggested we give him a bit more time with medicine and love - and what do you know! Several days later he was standing up and slowly wagging his tail. Now Ollie has a forever home with the most amazing mama, Ditta! Our dear friend Greg called us one morning after finding two tiny female puppies in a cardboard box in front of his front door. Using the power of social media we posted the little girls photos and less than 24 hours later we found a forever home for the sister ! They are now living their best life with their mama + brother pup in Bali. Our sweet Pepper! I woke up one morning to the crying of a little black puppy outside my front gate. Covered in ticks and soaking wet, I picked Pepper up and got to work! One hour later, and much, much cleaner Pepper was on her way to the vet for her first checkup. Pepper stayed with me for two weeks and was adopted to a great family with a sister pup named Pasta! We rescued Ms. Muffy in July 2018. We spotted her wandering the road to the beach and after our beach walk she had made her way down to the ocean. I noticed a large red tumor coming out of her lady parts and knew right away she had TVT Cancer. We acted quickly and took her home on the scooter. Our vet came and took Muffy in and we began her chemo treatment. Muffy was adopted by Dr. Witari's assistant and is having her second chance at life!